HACCP is a management system in which food safety is addressed through the analysis and control of biological, chemical, and physical hazards from raw material production, procurement and handling, to manufacturing, distribution and consumption of the finished product. For successful implementation of a HACCPcplan, management must be strongly committed to the HACCP concept and its mission critical benefit for food safety. In other words, firm commitment to HACCP by top management provides company employees with a sense of the importance of producing safe food, and teh implementation will be easier and much more effective. ISO 9001 Lead Auditor training. HACCP is designed for use in all segments of the food industry from growing, harvesting, processing, manufacturing, distributing, and merchandising to preparing food for consumption. Prerequisite programs such as current Good Manufacturing Practices (GMP) are an essential foundation for the development and implementation of successful HACCP plans. Food safety systems based on the HACCP principles have been successfully applied in food processing plants, retail food stores, and food service operations. The seven principles of HACCP have been universally accepted by government agencies, trade associations and the food industry around the world. The USDA also recommends a Total Quality System Approach integrating HACCP and ISO 9001. As a result ISO 22000 was released. This international standard, which has been adopted worldwide efficiently combines HACCP and ISO 9001 into one integrated Management System. 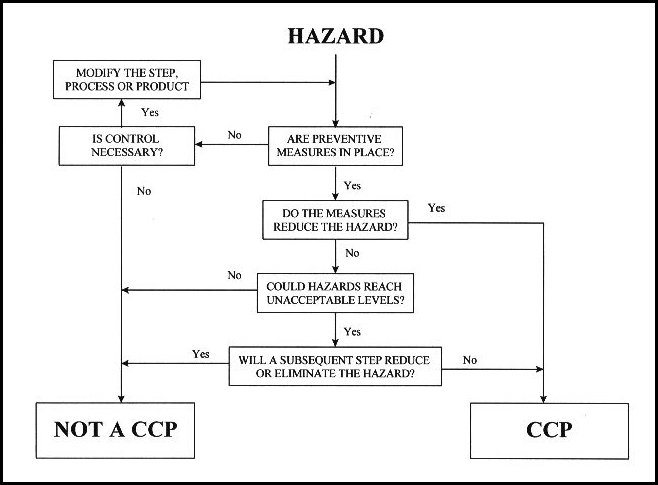 The basic HACCP hazard control and methodology are illustrated in the following flow chart. They need to be implemented through all phases of your production and delivery where a potential safety hazards exists. Prerequisite programs such as Good Manufacturing Practice (GMP) are required to achieve an effective implementation. ISO 22000, the food safety management systems (FSMS standard, now includes both ISO 9001, the prerequisite programs and HACCP in an integrated approach). What are business benefits of HACCP? Reduce and possibility eliminate liability related to food safety. Improve day-to-day service delivery and ensure consistency in product quality and safety. Help your sales and marketing capability by being HACCP compliant or better yet being HACCP certified. The certification is the best way to communicate to potential customers that your are compliant, bid for some government contracts, and make the government agencies (i.e. USDA) have more confidence in your food safety programs.